Properly providing bicarbonate solution in a cost effective manner is a challenge for hemodialysis providers. Preparation and disinfection can be time-consuming and labor intensive. Bicarbonate can corrode certain metals and painted surfaces leaving your preparation area encrusted and grimy. Furthermore, if not mixed properly, bicarbonate can negatively affect the dialysate solution. rust and corrosion from destroying the equipment. • Low profile 70 or 100 gallon tanks allow easy bicarbonate powder loading. 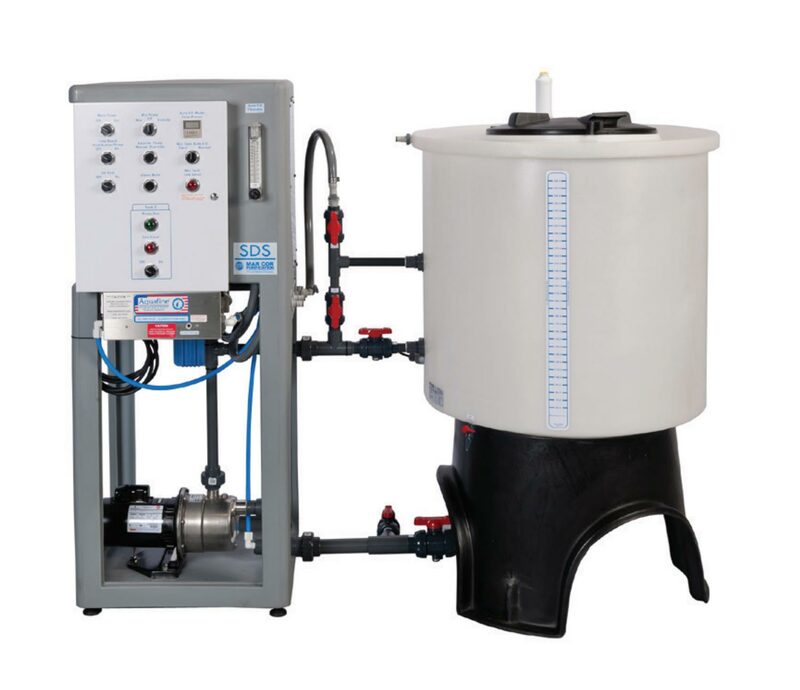 • Complete bicarbonate mixing is attained with a powerful stainless steel 3/4 hp pump system. The internal static mixer has no rotating parts to jam or break. • Ultraviolet irradiator with a 254 nm UV lamp in bicarb fluid path to discourage bacterial growth. • Automatic level control switch with audible and visual alarm alerts the user of low distribution concerns. Adjustable automatic level controller can be set to mix a variety of concentrates. • Gravity feed head tanks balance the distribution and eliminate air locks and pressure spikes at the point of use.